"…picked up the MadStad 20" windshield for my bike. It mounts on the regular windshield brackets, their adapter giving you even more height adjustment than the KTM does with lots of angle adjustment options. 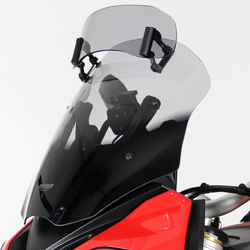 You retain the full up/down capability of the 1290 windshield brackets. 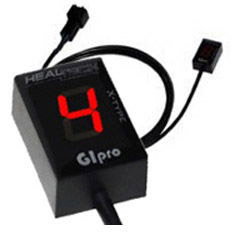 I found that in the lowest setting on my bike (yet there's still more I could lower on the MadStad bracket itself) it works fantastic, leaned back as much as possible. Notice the angle of attack, much more tilted than you would think, right? But at this angle, I find that it is at my chin (right under it) height, so I see over it, and the wind is completely nullified. Enough smooth breeze comes up under the windshield, so its cool and I feel air, but there's no pressure. Like riding at 20 mph. In retrospect I wish I'd opted for the 18" one, so it would not be as close to headlight. …The smooth air remains constant at any speed. I even got it up briefly to 100 mph (160 kph) and it remained steady. Some minor vibrating on windshield over 75 mph, but nothing too annoying. This is definitely a keeper for me, since I do tour at the higher highway speeds of the USA than most Europeans ride at." !quote, screens, 2015, 2016, 15, 16!